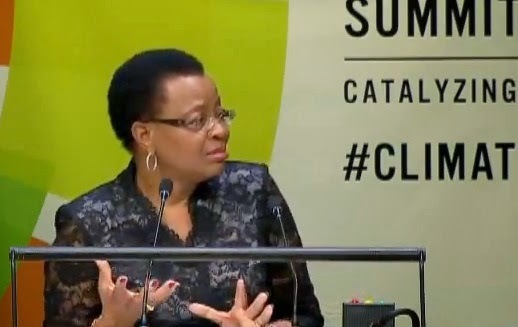 Graça Machel: Are pledges enough to avoid the climate change precipice? The widow of Nelson Mandela, Graça Machel, addressed the UN Climate summit in the closing ceremony directly after UN General Secretary Ban Ki-moon's closing statement and questioned whether the pledges made so far meet the challenge that we face. Because our very survival may depend upon these decisions. "We have reached a tipping point" she said, "So our commitments must be ambitious enough to stop us falling over the precipice. And personally I have mixed feelings. I acknowledge that there is the beginning of understanding of the gravity of the challenge that we face. But at the same time I have the impression that there is a huge mismatch between the magnitude and of the challenge and the response that we heard here today. The scale is much more than what we have achieved." Machel highlighted the huge marches on Sunday in New York, Melbourne and around the world demanding action on climate justice, which brought applause from those in the chamber. "So the obligation in my view is to step up the ambition, is to maximise fairness, to increase the momentum, and to make sure that from now to Paris, each one of us has made their homework of matching the magnitude of the problem with the response we are prepared to do. We, citizens of the world, will be watching." Machel told the 120 world leaders and other representatives gathered. I won't be speaking to you today about facts and statistics. We have heard them all before. Scientists have provided all the information, they have provided evidence. Because I have heard here from this impodium some years back pledges made. In 2000 when we were pledging the Millenium development goals we made promises and everyone was full of enthusiasm as we are today. And 15 years later we are coming to say 'we didn't meet this. We failed here and here' These were millenium development goals but what we are talking about is the question of 'Are we going to survive?' or are we going all to surcomb? And with this I do not think we have a choice. It is not a question of a choice. It is a question of making the decision which is required to meet the challenge. That is why. More than this, this is a key human rights issue which requires immediate and inevitable response. As the elders, a group I am pleased to belong to, we say, 'Now not tomorrow'. The original version of this was published at San Fransisco Bay Area Indymedia.